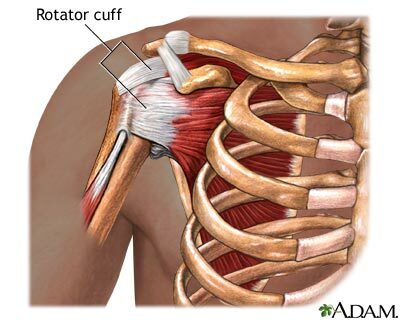 Rotator cuff injuries are very tricky and prevention and treatment depend on a lot of factors. How long has his injury been bothering him and was it due to throwing too much, too often, or from one specific pitch? Is there swelling in the shoulder area? Has he gotten a diagnosis from a doctor or an MRI? Generally, icing and stretching are always good as well as resting it from too much activity. Icing will be far less effective after the first 72 hours after an acute injury though. Doing light rotator cuff exercises and very gradually returning to throwing can begin after pain and range of motion returns. There are various protocols of stretches and exercises but in general you should only work through a pain-free range of motion and start off with relatively light and slow repetitions. Rehabilitation and workout sessions should progress slowly to avoid further aggravating or damaging the rotator cuff or related shoulder anatomy. I have an E-Book entitled "The Ultimate Guide to Healthy Shoulders" which includes pictures of specific stretches and exercises, along with other good tips, on how to prevent or improve shoulder injury. It may be useful to your partner. It can be downloaded to your computer, iphone, etc through Amazon Kindle, only costs $2.99.